Originally when I ordered this chunky yarn from Darn Good Yarn it was going to be for a shawl- which I frogged 3 times. Then told my husband "What I really want is a hat! A fun hat. It was before our day cruise and I wanted a fun and warm hat to wear on the cruise. Once I had that figured out, it just flew off the hook- even with keeping notes for writing up the pattern. The yarn is stunning. As good as the colors look, the spin is lovely, very regular and the texture is so very soft. When I pulled it out of the the envelope, I told my husband that he had to touch my yarn. Here it is! I hope you enjoy this too. large yarn needle for weaving in ends. rsc= reverse single crochet- you can use a single crochet, it will look a little different. repeat ** means repeat the steps between the asterisks. Row 2: Ch 1 (does not count as first sc), rsc in each st across. Row 4: Ch 1 (does not count as first sc), rsc in each st across. Row 6: Ch 1 (does not count as first sc), rsc in each st across. Row 8: Ch 1 (does not count as first sc), rsc in each st across. Row 10: Ch 1 (does not count as first sc), rsc in each st across. Row 12: Ch 1 (does not count as first sc), rsc in each st across. Row 14: Ch 1 (does not count as first sc), rsc in each st across. Row 16: Ch 1 (does not count as first sc), rsc in each st across. 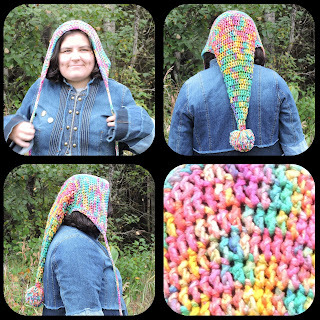 Rejoin yarn in the back, and single crochet around the base of the hood, at the tips of the ear flaps, put in 3 single crochets to work around the corner. sl st to join. Ch 1, single crochet around, at the center of the 3 sc at the tip of the ear flaps, sc, ch 50, sl st back up ch, sc in same st, continue sc around to tip of the second ear flap, repeat. Make 3 pom poms or tassels, one large, 2 small. 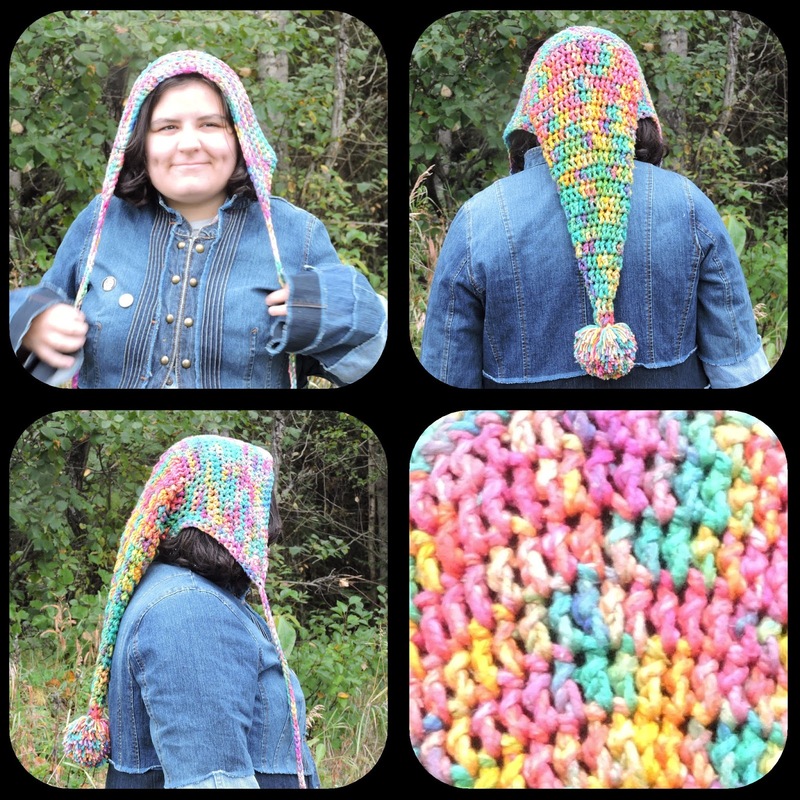 Attach the large one to the pointy top of the hat and the other 2 to the cords for the hood. Get a discount at Darn Good Yarn using the link below!